Rep. Tom Rooney (R-FL), a member of the House Intelligence Committee, on Wednesday slammed his committee’s Russia probe, calling it a tool for Democratic leaks and asking for it to be shut down. Tonight, I’d asked our Chairman Conway that we need to end this investigation. It has been going on for a year. We interviewed scores of witnesses and now, we have gotten to the point now where we are literally bringing people in for nine hours just so the Democrats can leak to the press something as ridiculous as white lies, not having anything to do with the Russia investigation, but that drives the whole story for the whole next day. Rooney was referring to reports that Hope Hicks, White House communications director, allegedly said she sometimes tells white lies for the president. The question was have you ever lied for the president? And which as you know is an extremely broad question. That could be like me telling a staffer to tell somebody that’s calling on the phone that I’m not here. That would be asking my staffer to lie for me. So, that would include the question being asked was. So, I actually chimed in at that moment and said, can we please specify as to whether or not if you are asking her if she’s ever lied for the president with regards to the Russian investigation, her testimony here, or anything that she said during this testimony, because then that would be an impeachable — in a court room, that would be impeaching the witness that she is not truthful. And of course to that she said she has not lied with regard to any of those things. “It was a trap. It was a trap, and that is what our investigation has become,” he added. 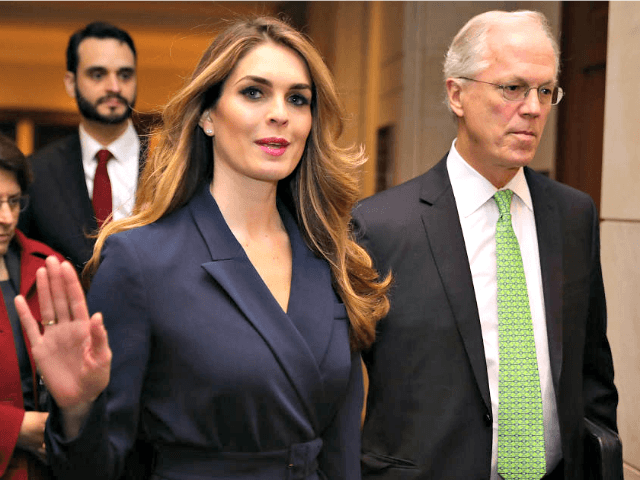 The committee hearing yesterday lasted for nine hours and the one thing that got out that you’ve led this program with that Hope Hicks lies for President Trump was obviously leaked by the Democratic side of the aisle to the media and that has driven the news today. Not the nine-hour testimony that she gave of her knowledge of what Russian collusion or lack thereof may have been in the 2016 election cycle, but this one nugget. “If we have reduced ourselves so far to get to the point now where we’re just leaking stuff like this, rinky-dink things like Hope Hicks tells white lies for her boss, then we have gone completely off the rails and this investigation needs to end,” he said. He said throughout the entire investigation “not one witness” has come forward with any evidence of collusion, conspiracy, or coordination between the Trump campaign and the Russian government. “And so, now, we are basically going through the motions and trying to find tabloid types news to give to you guys that becomes the driving cycle of the day, and that needs to end,” he said.